There’s a big difference between auto maintenance and auto repair. Maintenance is something that just about anyone can do. It involves basic actions, such as changing the oil or replacing the windshield wiper fluid. Repairs are a bit more complicated and require at least a basic understanding of automotive engineering and how things work. However, minor repairs, such as replacing burned out headlights or fuses, can be done by most people if they read the owner’s manual or view manufacturer-specific how-to videos online. Whether you are ready for significant repair work or just want to stick with basic maintenance, you can get all of the Fall River auto parts and services you need at LaCava Auto Supply. When it comes to getting quality Fall River car parts and accessories, you can count on LaCava Brothers to get you the parts you need without having to drive all over town to find them or wait for online shipping. There are lots of reasons why vehicle owners in Southeastern Massachusetts choose to complete do-it-yourself (DIY) projects at home instead of taking their car into the shop. The number one reason is cost. Taking your vehicle to the dealer or another professional repair shop can be costly, and it seems as though everyone is trying to live more frugally these days. Another reason is taking responsibility for the ongoing maintenance of your own vehicle. Learning the basics of auto maintenance can help you spot small issues before they become big and expensive problems. It can also provide a means of learning more about your own vehicle so you’ll know what to do if something more significant occurs in the future. 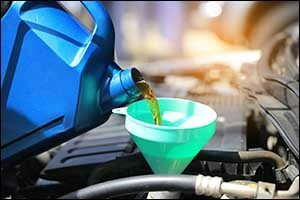 With “quick lube” establishments charging $50 and up for this type of service, it is in your best interest to learn how to do an oil and oil filter change. You only need basic tools, such as an oil filter wrench, ratchet, oil pan, and funnel, and it takes less than an hour for even a novice to get the job done. Check your manufacturer’s recommendations via their website or the owner’s manual to find suggestions for the type and weight of oil required, as well as how frequently the oil change should be done. It will be somewhere between 3,000 and 10,000 miles, depending on the make, model, and year of your vehicle, as well as the type of oil and oil filter that you use. You can find all of the supplies you need for an air filter change at LaCava Auto Supply. We have all of the Fall River car parts and accessories required to complete most of the maintenance and repair work that you will want to do. You can change an air filter in about 10 minutes or less. This preventive maintenance should be done about every 12,000 miles of driving or ever 12 months of use, whichever comes first. A mechanic might take a whole day, but you can do it yourself at home in a fraction of the time. Use your owner’s manual to locate the air filter and match the size/type and brand of filter, according to your needs. You can also extend the life of your air filter by spraying it with compressed air whenever you perform an oil change to clear out any excessive debris. Depending on where you live, you might have to change out your windshield wiper fluids more frequently. In Southeastern Massachusetts, this means about twice each year. A good rule of thumb is to change them in the spring after the punishment that your existing wipers take during the winter months and then again in the fall in preparation for winter’s return. This will ensure that you are able to safely keep your line of vision clean and clear, no matter what Mother Nature can throw at you. Visit LaCava Auto Supply in Fall River to see our full line of quality windshield wipers. It takes about 10-15 minutes to remove the existing wipers and install a new set. If you don’t have time, we offer this as a free service to customers who purchase a pair of new wipers at our Fall River auto parts and services center. Most vehicle owners don’t even think about the car battery until it stops working one day. You can extend the life of your car’s battery in just about 20 minutes a couple of times each year. 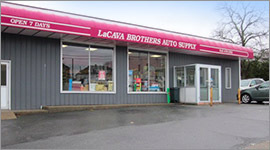 Stop by LaCava Auto Supply in Fall River to pick up some corrosion-removal fluid, a wire brush, and some auto rags. Use a wrench to carefully remove the battery terminals – always removing the negative cable first. Clean off the posts using the corrosion-removal fluid. Stay away from home remedies, which can include Coca-Cola, baking soda, and seltzer water, sticking with professional solutions for best results. Use the wire brush to get any stuck on bits of dirt and grime. Rinse the cleaning fluid with a bit of water and then thoroughly dry the posts with the auto rags. Replace the battery terminals – always reconnecting the positive cable first. If you want to do even more, consider looking online for videos and step-by-step information to perform a radiator flush, change spark plugs, change brake pads, replace the fuel filter, and other straight-forward projects. Know when to call in a professional or seek out advice and support. Don’t take on anything that you know you can’t handle and make sure always to get the tools and products you need at LaCava Auto Supply in Fall River. Give us a call at 508-676-1951 or stop by our location on Bedford Street in Fall River to take a look at our wide selection of tools, parts, and services.